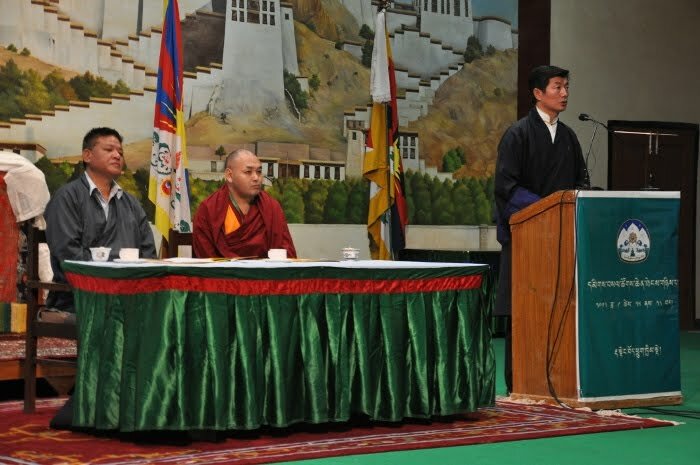 It appears that the Speaker of Parliament and the Sikyong (formerly Kalon Tripa) both used their closing speeches at the Special Meeting on September 29, 2012 to respond to concerns raised in TPR’s September 22 editorial, “Are the Speaker and Kalon Tripa Suppressing Free Speech?” A video of their responses is below, together with an informal translation, followed by a few concluding thoughts. Sikyong Sangay: "It is very clear that the Tibetan Administration is recognized. Despite this, a few minority say that they do not recognize it. I said, because of those few, His Holiness was disheartened. However, it has nothing to do with Independence or Middle-Way. From what I hear, the heated discussion between Independence and Middle-Way... Discussion should be there, but there is likelihood of mishaps. Hence, I urge all the delegates here to try to refrain from such mishaps." Speaker Tsering: "It is caused by some organizations and individuals who alleged that His Holiness dismantled the Tibetan-Government-in-Exile. Since there are news of many misunderstandings in our exile community because of associating this issue with Middle-Way and Independence, we are deeply concerned about it. Those who seek independence, they always have the right to seek independence. No one can take away their right. From the historical perspective, the independence of Tibet can be proven. But in some parts of history, when we say Tibetan independence, there are many discrepancies as to whether all the three provinces can be included or not. There can be many descriptions on the pros and cons of Middle-Way and Independence, but those who seek independence have right to seek independence." We believe that a commitment to free speech should go without saying, but given the facts, maybe the obvious needs stating. From a broader perspective, unfortunately, the administration’s response missed the crux of the concern. The administration asserts its commitment to free speech, but it remains to be seen whether it will continue to employ tactics that are inconsistent with this principle. Withdrawing its claim that the people must “accept whatever policies are decided upon by the government”. We believe that such steps will ensure that the administration’s actions do not — knowingly or unknowingly— harm the democratic principles for which His Holiness and all Tibetans strive.